Assume you have a small notebook with 10 pages and you want to write some data in this notebook. You just start writing on the first page up to the end of the notebook. Maybe you decide the information on page 5 must be destroyed. Probably you will just take out the page and burn it. Unfortunately data on a harddisk doesn't work this way. A harddisk contains not ten but thousands or maybe even millions of pages. Also it's impossible to take out a "page" of a harddisk and destroy it. To explain how a harddisk work, we will continue with our 10-page notebook example. But now we will work a little bit different with it. We will work in a way similar to how a harddisk works. This time we use the first page of our notebook as an index. Assume we write a piece about "WikiLeaks", then on the first page we write a line "piece about WikiLeaks: see page 2". The actual piece is then written on page 2. What we did, we removed only the reference to the article, but if we open page 3, we will still able to read the Goldman Sachs piece. This is exactly the way what a harddisk does when your "delete" a file. With specialized software it still able to "recover" page 3. Well you will be surprised by the similarity between this example and the real world. You know when you removed the article on page 3 with an eraser, it is still possible to read the article slightly. The pencil leaves a track on the paper because of the pressure of the pencil on the paper and also you will be unable to erase all of the graphite. Small traces are left behind on the paper. If you really need this article, you can reconstruct (parts) of it, even if it's erased. With a harddisk this is very similar. Even if you erased every piece of data, it is sometimes possible with (very) specialized hardware to recover pieces of the data. If the data is very confidential and must be erased with the greatest care, you can use software to "overwrite" all pieces of data with random data. When this is done multiple times, this will make the data untraceable. The installation is very straightforward, just download the application and install it by hitting the next button. After installation this application will automatically start. You can then start using it for shredding files. However the best part of the program is that you can use it from within windows itself by right clicking on a file. 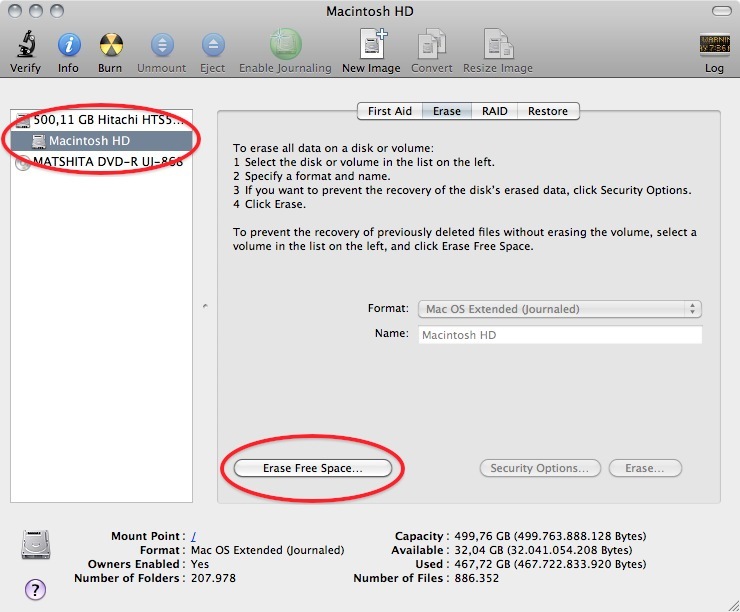 There are basically to build-in steps to make to securely delete your data on Mac OSX. 1. 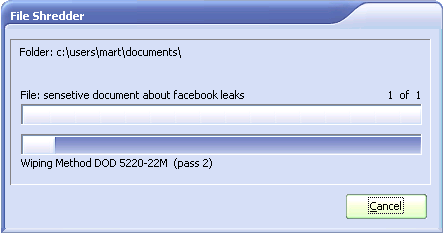 Erase the free-space on your hard-drive containing all the data of items which are deleted in an unsecure way. 2. Make sure that every file from then on is always securely deleted. 1. 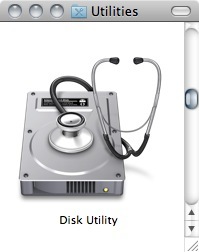 Open Disk-Utility which resides in the Utilities folder inside the Applications folder. 2. 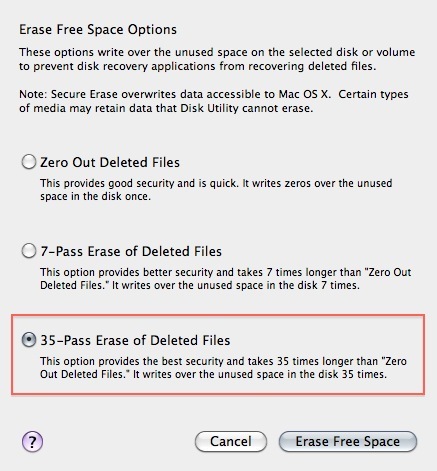 Select your hard drive and click on 'Erase Free Space'. 3. Three options will appear, from top to bottom more secure, but also they take much more time to complete. Read the descriptions on each one of them to get an idea from what will happen if you use them and then choose which one might suite your needs the best and click 'Erase free Space'. If time is no issue, then use the most secure method and enjoy your free time to get a good coffee while you Mac crunches away on this task. If the crooks are already knocking on your front-door you might want to use the fastest way. Now that your previously deleted data is once and for ever securely erased you should make sure that you don't create any new data that might be recovered at a later date. 1. 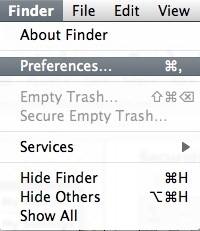 To do this open the finder preferences under the Finder Menu. 2. 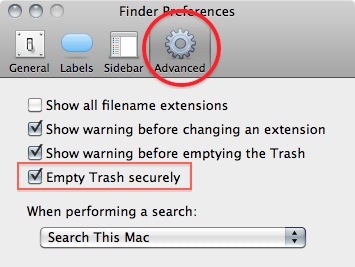 Go to the advanced tab and tick 'Empty trash securely'. This will make sure that every time you empty your trash all the items in it will be securely deleted and are really gone! Note 1: Deleting your files securely will take longer then just deleting them. If you have to erase big portions of unimportant data (say your movie and mp3 collection) you may wanna untick this option before doing so. 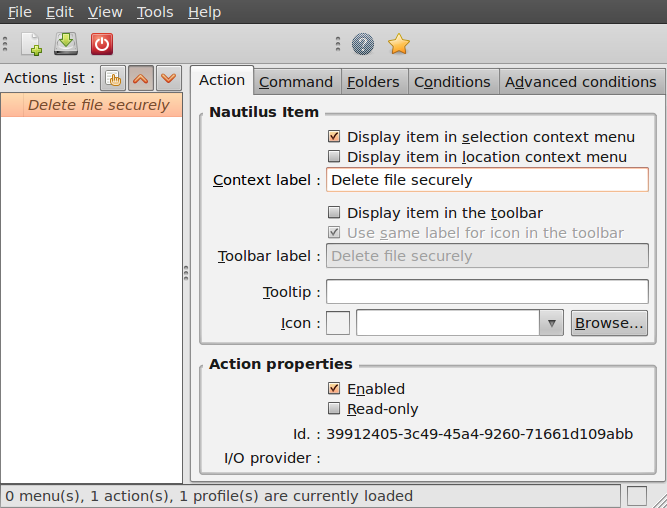 Unfortunately currently there is no graphical user interface available for Ubuntu to delete files secure. There are two command-line programs available though. 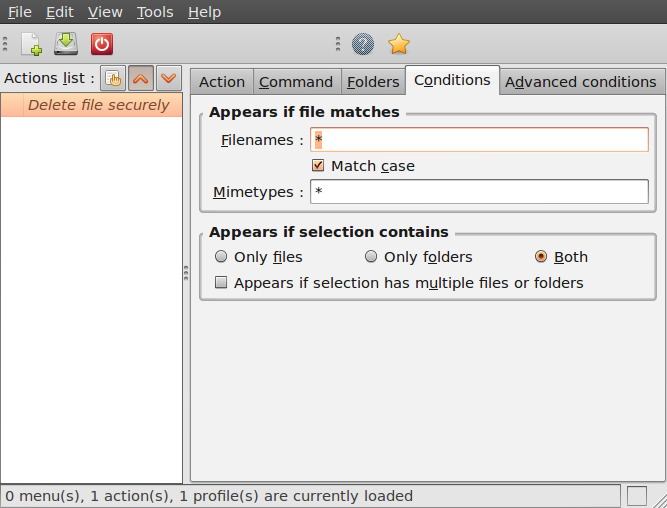 Shred is installed in Ubuntu by default and can delete single files. 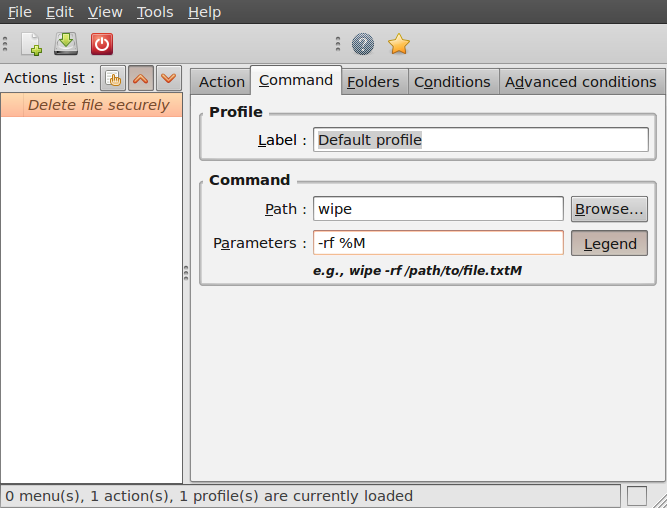 Wipe is not installed by default but can easily be installed with using Ubuntu Software Center or if you understand the command line you can install it with apt-get install wipe. Wipe is a little more secure and has nicer options. Next is describing the new action. You can give the action every name you wish. Fill out this title in the "Context label" field. In this example we used "Delete file securely"
Click on the second tab ("Command"), here is how we specify the action we want. In the field "Path", type "wipe", in the field parameters type "-rf %M", please be sure about the capitalisation of all characters here, this is very important. 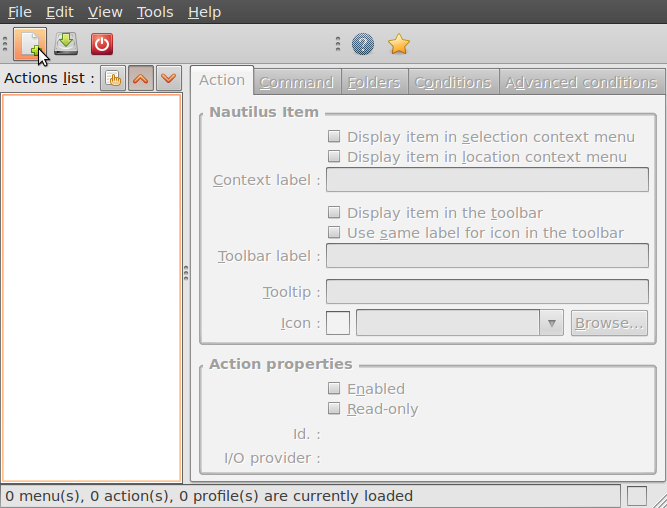 Now close the Nautilus Actions Configuration tool. Unfortunately, after this, you have to re-login into your system, so ether reboot or logout/login. -rf %M | zenity --info --text "your wipe is underway please be patient. The icon of the file to be wiped will disappear shortly." The above line will tell you the process is underway but you will not know the file is deleted until the icon disappears. 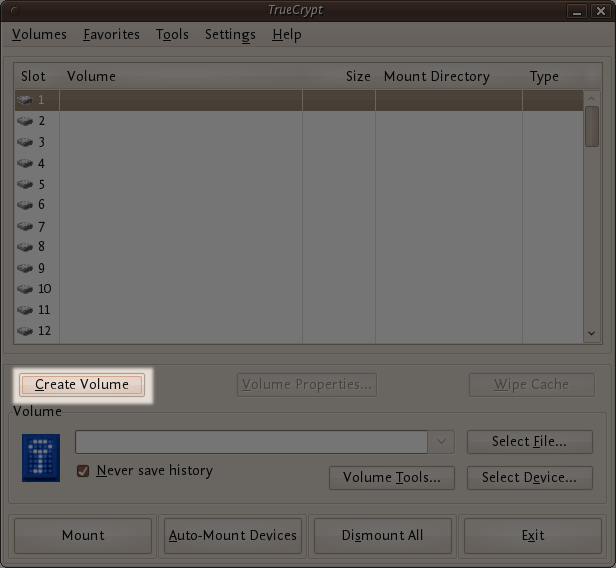 The following are step-by-step instructions on how to create, mount, and use a TrueCrypt volume. 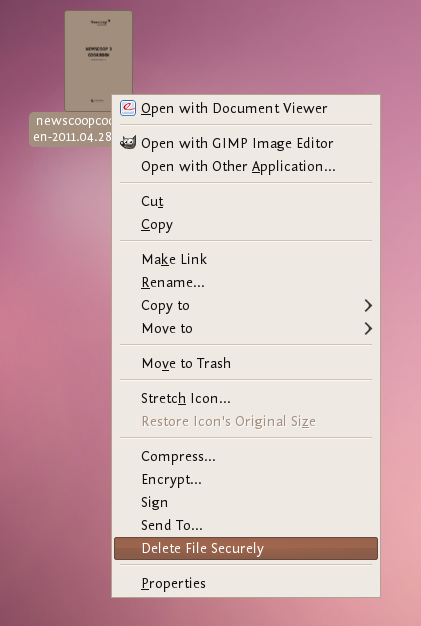 on MacOSX open it by clicking Go > Applications. 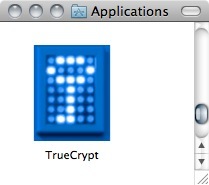 Find TrueCrypt in the Applications folder and double click on it. When the main TrueCrypt window appears. Click Create Volume. 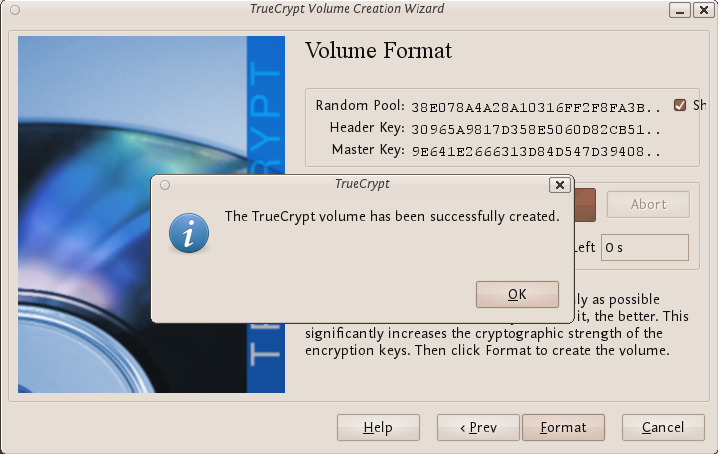 You should see the TrueCrypt Volume Creation Wizard window appear on screen. 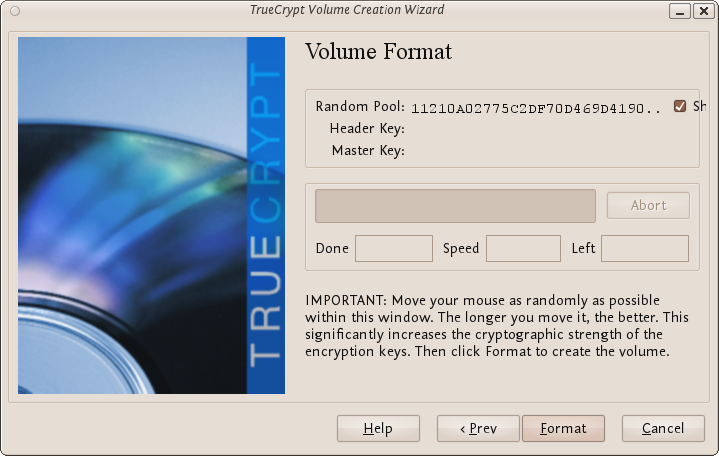 Where do you want to create the TrueCrypt volume? You need to choose now. This can be in a file, which is also called a container, in a partition or drive. 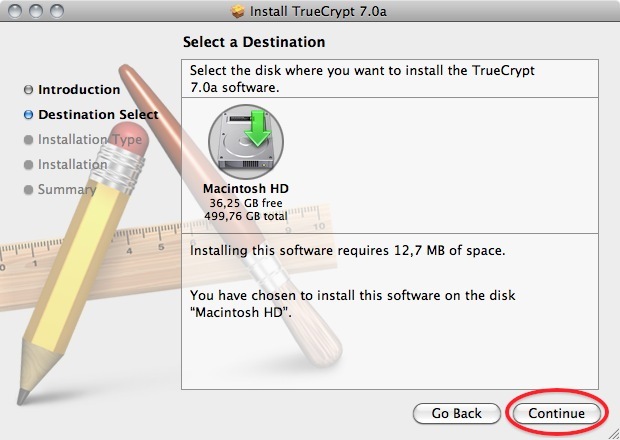 The following steps will take you through the first option creating a TrueCrypt volume within a file. Next you need to choose whether to create a standard or hidden TrueCrypt volume. We will walk you through the former option and create a standard TrueCrypt volume. You can just click Next, as the option is selected by default. 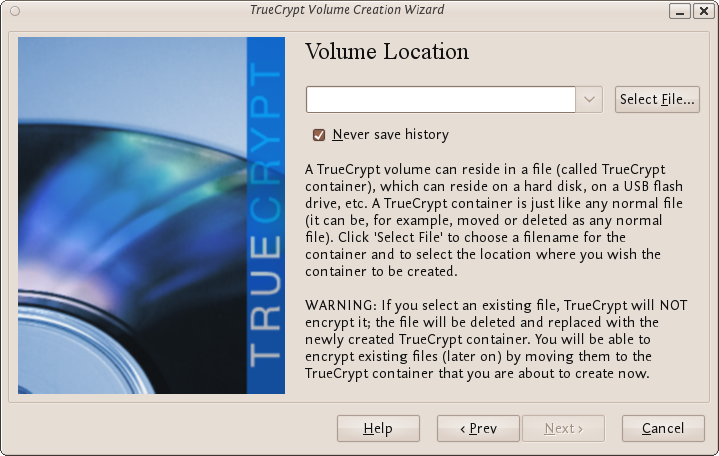 Now you have to specify where to have the TrueCrypt volume (file container) created. 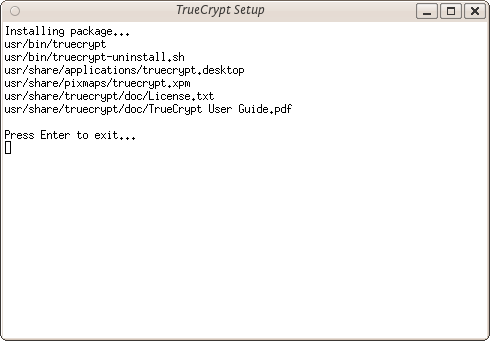 Note that a TrueCrypt container behaves like any normal file. It can be moved or deleted as any normal file. The standard file selector will now appear on screen (the TrueCrypt Volume Creation Wizard remains open in the background). 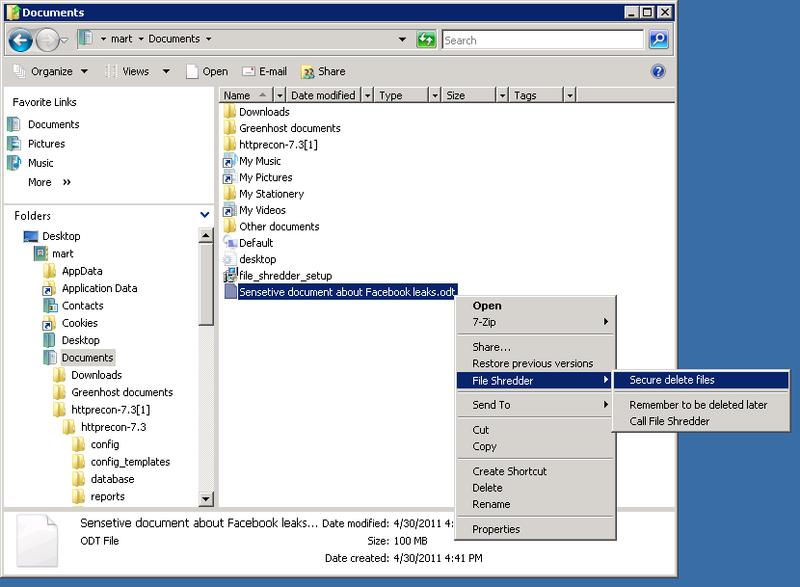 You need to browse to the folder that the file should be created in and then type into the 'name' field the name for the file you wish to create. 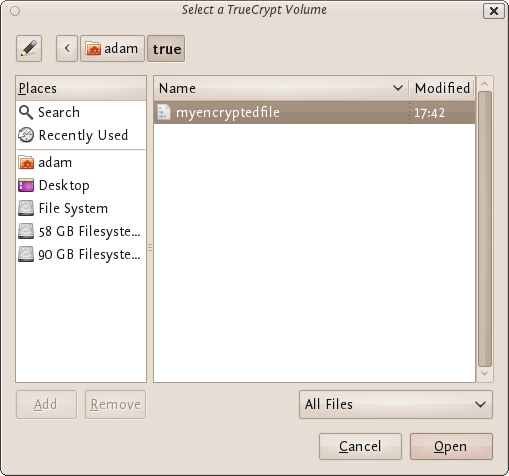 We will create our TrueCrypt volume in the folder 'adam/true' and the filename of the volume (container) will be 'myencryptedfile'. You may, of course, choose any other filename and location you like (for example, on a USB stick). 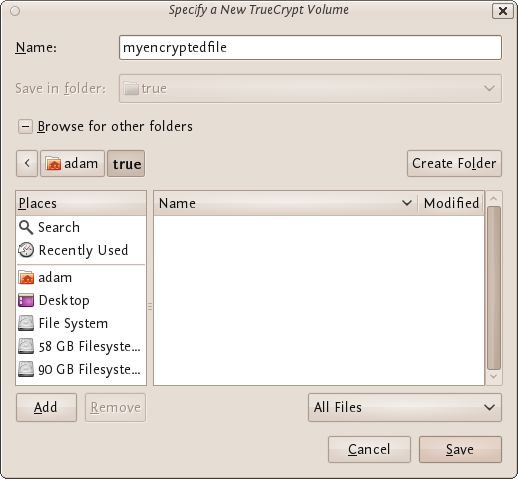 Note that the file 'myencryptedfile' does not exist yet - TrueCrypt will create it. Press 'Save' when you are ready. The file selector window should close. 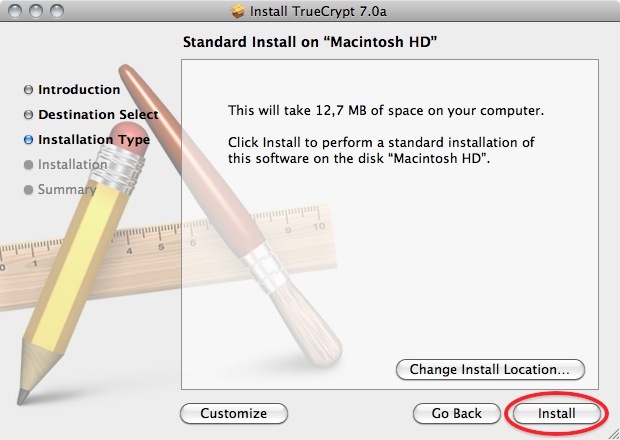 IMPORTANT: Note that TrueCrypt will not encrypt any existing files. If an existing file is selected in this step, it will be overwritten and replaced by the newly created volume (the contents of the existing file will be lost). 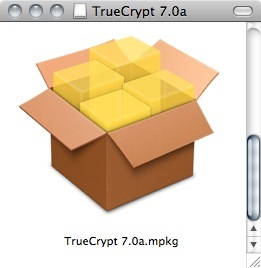 You will be able to encrypt existing files later on by moving them to the TrueCrypt volume that we are creating now. 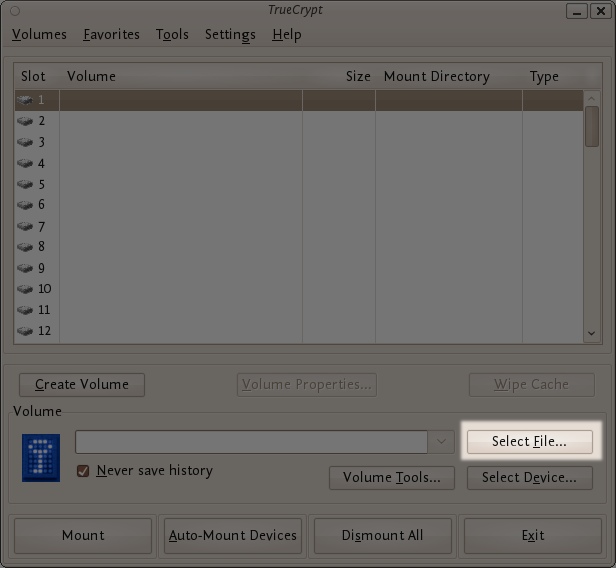 In the Volume Creation Wizard window (which was previously running in the background), click Next. Here you can choose an encryption algorithm and a hash algorithm for the volume. 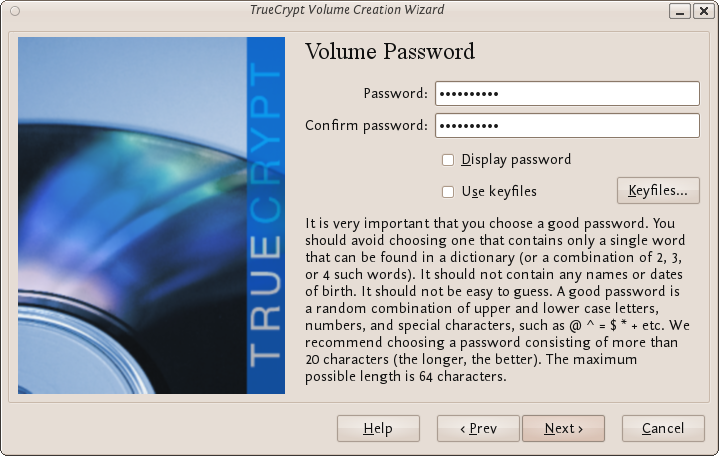 The TrueCrypt manual suggests that if you are not sure what to select here, you can use the default settings and click Next (for more information about each setting have a look at the TrueCrypt documentation website). Now choose the size of your container. You should be fine with 1 megabyte but for this example we will enter '20' into the available field. You may, of course, specify a different size. After you type the desired size in the input field, click Next. This step is really important, choosing a password. The information displayed in the Wizard window about what is considered a good password, should be read carefully. Choose a strong password, type it in the first input field. Then re-type it in the input field below the first one. When you are done click Next. Now you must choose the format of your partition (this step may not be available for you under windows or OSX). 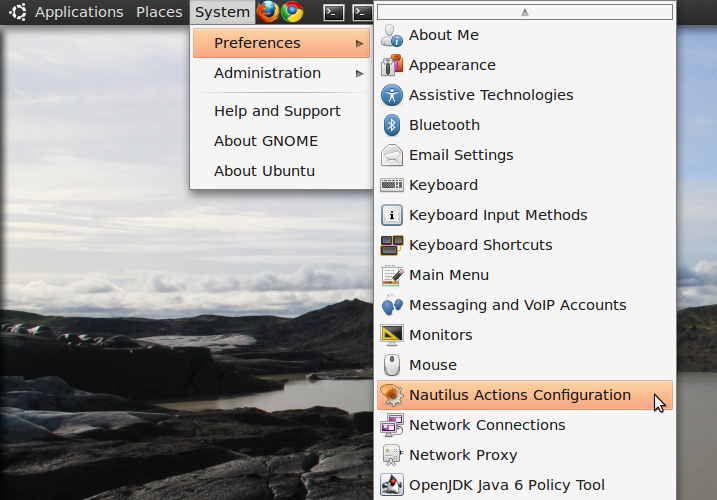 If using Ubuntu you can choose a Linux file type or FAT (Windows) for simplicity leave it at the default. 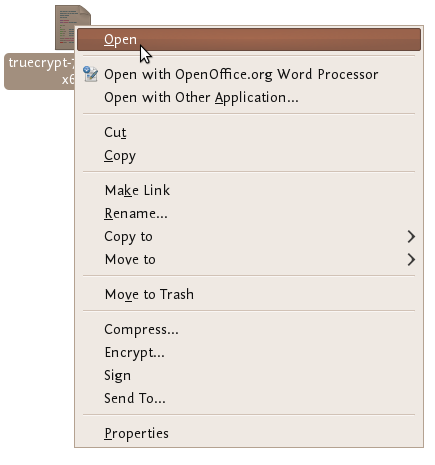 Next TrueCrypt tries to generate random information to help encrypt your container. For 30 seconds move your mouse as randomly as possible within the Volume Creation Wizard window. Move the mouse as much as possible for up to a minute. This significantly increases security by increasing the cryptographic strength of the encryption keys. security). Move your mouse around until you are bored. Well done! You've just successfully created a TrueCrypt volume (file container). Make sure one of the 'Slots' is chosen (it doesn't matter which - you can leave at the default first item in the list). Click Select File. In the file selector, browse to the container file (which we created earlier) and select it. Type the password in the password input field. 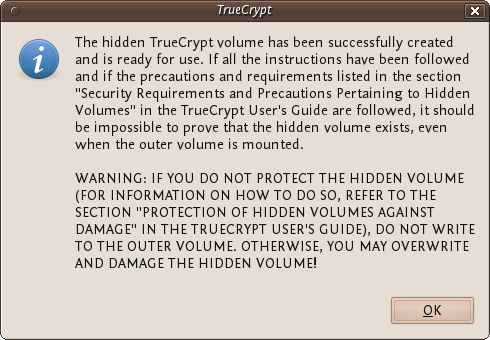 TrueCrypt will now attempt to mount the volume. If the password is correct, the volume will be mounted. If the password is incorrect (for example, if you typed it incorrectly), TrueCrypt will notify you and you will need to repeat the previous step (type the password again and click OK). We have just successfully mounted the container as a virtual disk 1. The container will appear on your Desktop or you will see it in your file browser. The disk that you have just created is completely encrypted and behaves like a real disk. Saving (moving, copying, etc) files to this disk will allow you to encrypt files on the fly. You'll be able to open a file which is stored on a TrueCrypt volume, which will automatically be decrypted to RAM while it is being read, and you won't need to enter your password each time. You'll only need to enter this when your mounting the volume. To do this right click on the drive and select unmount. This will automatically happen when you turn off your computer but will not happen if you just put the computer on sleep.